In March 2018, the world learnt that Russia possessed the Kinzhal (Dragger) unique airborne hypersonic missile system designed to destroy ground and sea targets. The MiG-31 supersonic long-range all-weather fighter jet developed by the MiG Design Bureau during the Soviet period and accepted for service in 1981 was chosen as a carrier for the new missile system. 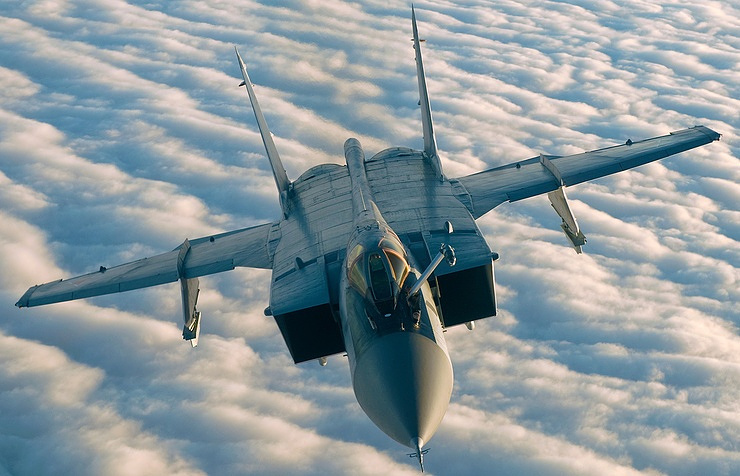 The MiG-31 or the Foxhound as it is called in the West is a veteran of Russia’s Aerospace Force but is still unique by its speed and altitude capabilities. The fighter jet can easily climb to an altitude of 25 km and accelerate to 3,000 km/h, after which the missile that reaches the point of its discharge within minutes starts its autonomous flight. Nuclear and conventional munitions are delivered to the target to a distance of up to 2,000 km. Moreover, the missile can deal a serious blow on the enemy without entering its heavily protected air and anti-ballistic missile defense system. 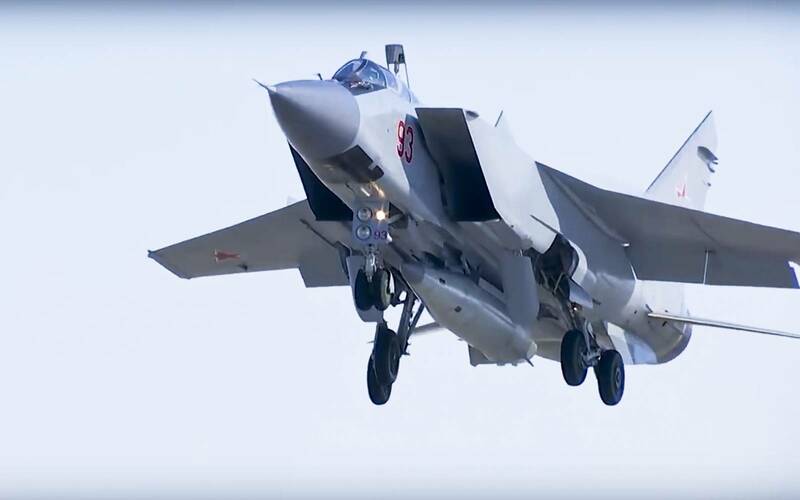 Thanks to the MiG-31’s high performance characteristics, the hypersonic missile with low radar signature and highly maneuverable capabilities of the Kinzhal system (the Kh-47M2 missile as some open sources report) has no rivals in the world. In 1977, Soviet test pilot Alexander Fedotov flying a MiG-31 plane climbed to an altitude of 37,650 meters in outer space. Up to date, the MiG-31 outflies actually the entire range of altitudes accessible for modern aircraft. Two years ago, a MiG-31BM plane set a new record of nonstop flight equaling 7 hours and 4 minutes (with two mid-air refueling operations). The unique materials together with the well-devised design make the Foxhound a record-setting plane by many parameters. In a video shown by the Russian president on March 1, a MiG-31BM plane delivered a missile to a point of its discharge, following which it flew at hypersonic speed (at more than 10 times the speed of the sound) and maneuvered at all the sections of its flight path. In the opinion of Russian Deputy Defense Minister Yuri Borisov, the basic specific task and complexity was to ensure that the missile could reach hypersonic speeds, i.e. about 10 Mach. “This allows approaching a target quite quickly as compared, for example, to cruise missiles that fly at an average cruising speed of around 850-900 km/h, i.e. the primary specificity is speed, in the first place,” the deputy defense minister said. As the second specific feature, it is capable of maneuvering during its flight with the help of aerodynamic control and bypassing air defense or anti-ballistic missile defense zones, Borisov said. As Commander-in-Chief of Russia’s Aerospace Force Colonel-General Sergei Surovikin said, the creation of the Kinzhal system marked an important breakthrough in the development of hypersonic weapons. A carrier aircraft delivers an aero-ballistic missile to the area of its discharge within just minutes, after which the main propulsion unit accelerates the munition to hypersonic speed within seconds. “At the final section of the flight path, a homing warhead is activated to ensure the required accuracy and selectivity of target engagement in any time of day or night,” the commander-in-chief said. The flight to the target also takes several seconds, which excludes the missile’s interception by air defense capabilities. The Kinzhal’s efficiency has been numerously proven during state trials. From December 2017, the first aviation unit in Russia’s Southern Military District armed with the Kinzhal hypersonic missile system went on experimental and combat duty to test the fundamentals of the system’s combat use. “This is far from being fantastic,” Deputy Defense Minister Borisov says. “Moreover, this is a class of precision weapons fitted with multifunctional combat capabilities making it possible to strike both stationary and mobile targets. Specifically, aircraft carriers and cruiser-class warships, destroyers and frigates are potential targets for this weapon,” the defense official said. 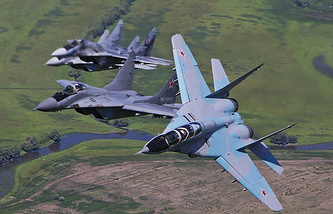 In the opinion of TASS military expert Viktor Litovkin, the deployment of MiG-31 fighters carrying the Kinzhal hypersonic missile systems in the Southern Military District can be most likely explained by the need “to keep under control the Black Sea area,” which US and NATO warships armed with Tomahawk long-range cruise missiles regularly enter, posing a threat to strategic missile systems in Russia’s European part. “The Kinzhal system is precisely intended for their deterrence. Intruders must know about this,” the expert said. Incidentally, the crews of Kinzhal airborne hypersonic missile systems in the Southern Military District have already performed about 250 flights day and night in various weather conditions since the beginning of 2018, according to the reports by Russia’s Defense Ministry. On March 11, Russia’s Defense Ministry posted new footage of the Kh-47M2 hypersonic missile’s trials. The video shows a MiG-31 fighter jet without external hardpoints for R-33 air-to-air missiles making part of the fighter’s organic armament. A new external sling has been specially developed for the Kh-47M2, which suggests the weapon’s big weight. As military experts presume, the fighter jet may get a new modification in the future, for example, the MiG-31K. It should be noted that initially the aircraft was an interceptor rather than a carrier of air-to-surface weapons. The data of open sources suggest that the Kinzhal is a distant prototype of the Soviet Kh-15 tactical attack missile accepted for service in 1988. At the same time, the Kinzhal’s external outlook has similarity with the 9M723-1 aero-ballistic missile (NATO reporting name: SS-26) of the Iskander-M missile system. It has a flight speed of up to 1,800 m/s and an operating range of 400 km. Most likely, the Kinzhal’s first stage was developed on the basis of the Iskander missile system. The missile’s front part shown in the video was blurred. The Kh-15 hypersonic missile with the thermonuclear warhead was regarded as a Soviet response to the US SRAM missile that went into service in the US Air Force in 1972. The Kh-15 was intended for arming Tu-22M, Tu-95MS and Tu-160 strategic long-range bombers. However, before the disintegration of the USSR, only several regiments of Tu-22M3 long-range bombers had the time to learn to operate the new missile. The mass production was impeded by economic problems and the range unsatisfactory for the military as it did not allow operating outside the area of enemy air defenses. When launched from a bomber, the Kh-15 could climb to an altitude of over 40 km and then dive at the target following the trajectory close to the ballistic flight path and developing a speed of Mach 5. Russia started to gradually phase out the Kh-15 missile in the early 2000s owing to the termination of its serial production and the expiry of the warranty period of keeping solid-propellant components. It is known that it was used as the basis to develop missiles with conventional warheads – the Kh-15P anti-radar missile and the Kh-15S anti-ship missile. Su-27 fighter jets could be among carriers for the latter missile; however, there are no data on its acceptance for service. Despite such similarity in design, the Kinzhal’s performance characteristics are by a factor higher than the parameters of the 9M723-1 and the Kh-15. The MiG-31 was upgraded along with the development of the hypersonic missile for the Kinzhal system. With the Kinzhal, the MiG-31 interceptor has assumed its new role of an attack aircraft. Incidentally, its predecessor, the MiG-25, was also upgraded to get the capability of striking ground targets with free-fall bombs. The first Soviet fourth-generation MiG-31 combat plane was developed in the 1970s by the Design Bureau 155 (currently, the Russian Aircraft Corporation MiG) led by Chief Designer Gleb Lozino-Lozinsky. Initially, the Soviet air defense aviation wanted the new fighter jet to fly faster than the MiG-25. At that time, it was the fastest fighter jet in the world, developing a maximum speed of 3,000 km/h. The new project already stipulated requirements for a speed of 3,700-4,000 km/h. A double-circuit D-30F6 engine with the maximum thrust of 152 kN being developed on the basis of the civil D-30 motor mounted on the Tu-134 airliner was ordered for the project. While retaining the general configuration, the production technology and the dimensions of the MiG-25, the new project got a crew of two. The stiffness of the wings and air intakes was increased to provide for the aircraft’s flights at supersonic speed close to the ground. 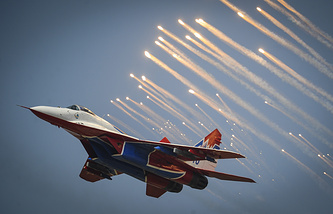 Compared to the MiG-25, the share of steel used in the MiG-31 fighter decreased while the proportion of titanium and modern aluminum alloys increased. As a result, the world’s heaviest and fastest fighter-interceptor emerged. The MiG-31 performed its debut flight on September 16, 1975. The prototype aircraft that took to the skies was piloted by Mikoyan Design Bureau Chief Pilot Alexander Fedotov. An experiment was conducted at the Akhtubinsk testing center’s proving range in 1978 to simultaneously track ten air targets with the Zaslon radar. The targets moved in a front of 150 km wide. The fighter jet flew at an altitude of 5,000 m. Five targets moved below the interceptor at altitudes of 1,400 m to 2,600 m while the other five were above the plane (from 8,400 m to 9,600 m). It was for the first time that four air targets were simultaneously destroyed by four missiles. Notably, several months later, the Americans reported that their spy satellite had registered the destruction of an air target at an altitude of 60 m by an air-to-air missile launched from a distance of 200 km by the “modified MiG-25” flying at an altitude of 6,000 m.
The MiG-31 was shown to the world public for the first time at the Le Bourget air show near Paris in 1991. The fighter-interceptor was produced in 1975-1994 at the Sokol Aviation Enterprise (currently, Nizhny Novgorod). Overall, more than 500 such planes were built. The MiG-31 was specially developed to repeal massive attacks by small cruise missiles flying at low altitudes. For all the years of its operation, the aircraft underwent upgrades. It should be noted that interest in the fighter-interceptor increased each time after US and NATO’s military operations, especially after the bombing of Iraq, Yugoslavia and Afghanistan. The project of the MiG-31M interceptor was not carried through. In 1993, it became the first fighter in the world to hit an air target at a distance of 200-228 km (with the K-37 missile). The MiG-31D was another version of the 1980s that did not enter service due to the disintegration of the Soviet Union. It was an element of the Russian anti-satellite system 30P6 Kontakt. 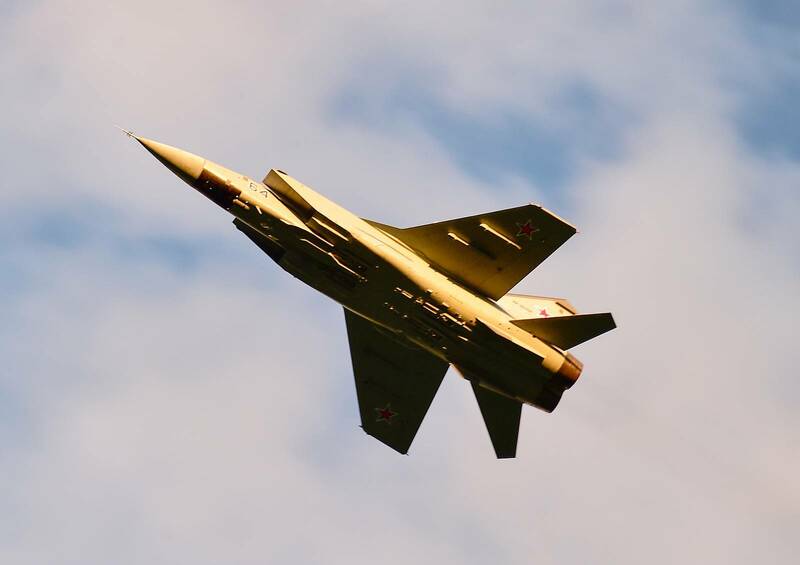 The fighter jet was expected to carry a three-stage missile developed by the Moscow Institute of Thermal Technology (the institute also designed Topol-M and Bulava strategic missiles). As compared to the standard MiG-31, the ‘satellite fighter’ had neither an unnecessary radar nor a gun. The engines were modernized to increase thrust at a high altitude. The trials were held at the air defense troops’ Sary-Shagan practice range in Kazakhstan where anti-missile defense systems were tested. In 1991, the program was halted. In 2001, the MiG-31S project was presented for the launch of small commercial satellites. The Mikron carrier rocket could deliver a satellite weighing 100 kg into orbit at an altitude of 200 km. The rocket was intended for its launch at a speed of 2.3 Mach at an altitude of 20-25 km. A three-seat rocket plane could be another planned load for the MiG-31S for suborbital flights. It was viewed as a vehicle to train cosmonauts and also carry out tourist and advertising flights. In 2005, Russia and Kazakhstan announced plans to create another aerospace system called Ishim to deliver small-size satellites into the near-Earth orbit. 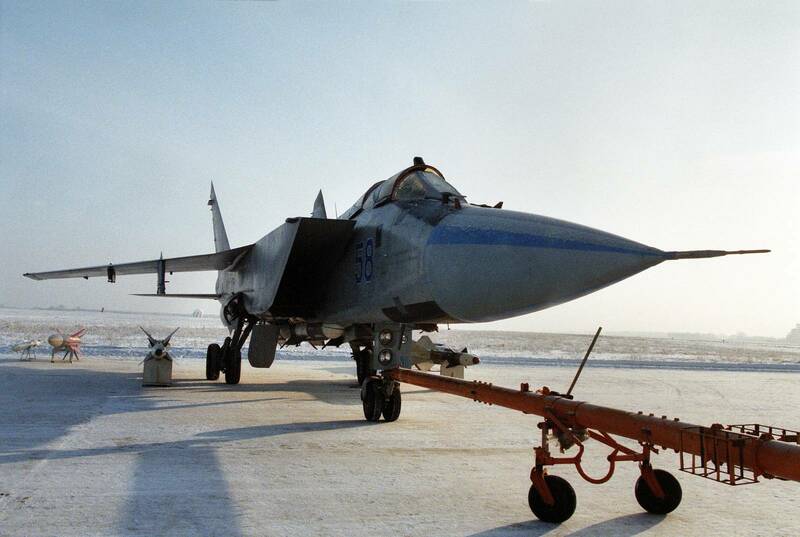 The MiG-31I and the three-stage solid propellant rocket created by the Moscow Institute of Thermal Technology and carried under the fuselage were designed to deliver a satellite weighing 160 kg into orbit at an altitude of 300 km. The modernized MiG-31BM was due to get new armament, including long- and medium-range K-37M and K-77M air-to-air missiles tested aboard the MiG-31 fighter, as well as new 9M96 missiles from the S-400 air defense system. The operation range of the modernized radar must be adequate to new missiles. The radar could track 24 targets and guide missiles towards eight of them. The upgraded cockpit was equipped with liquid-crystal displays. The aircraft was due to get new electronic combat systems. From 2011, work was launched at the Sokol Enterprise in Nizhny Novgorod to upgrade aircraft to the MiG-31BM version. In 2013, the first pair of aircraft went on combat duty at the Monchegorsk airfield in the Murmansk Region in northwest Russia. According to the data of open sources, about 100 modernized MiG-31BM are in operation today. The MiG-31BM incorporates a new weapon control system and radars allowing the aircraft to detect targets at a distance of up to 320 km and destroy them at a distance of up to 280 km. The aircraft is capable of tracking up to ten and destroying six air targets at a time. However, it is less maneuverable than most of modern fighter jets but the operation range of the radar and missiles coupled with the possibility to engage several targets at a time allows it to avoid a close encounter with an enemy. The aircraft has a combat radius capability of 700 km to 1,500 km, depending on the load and the flight speed. A group of four aircraft is capable of covering the airspace along the front of up to 1,000 km, for example, from Moscow to Krasnodar. The MiG-31 is capable of intercepting any targets in the air, hitting cruise missiles within the entire range of their altitudes and speeds and destroying satellites operating in low orbits.